The almighty leap which Shadow emerged from through the trees ended with a silent roll to the ground. Standing upright, Shadow then held a rather cheerful expression to his features. It was a good day; he had acquired his dream weapons, the Royal Katana. Precision instruments of destruction, is the kind of label you would give to the Katana which now belonged to Shadow. Another thing was keeping his hopes up, the fact that he also acquired 2 tomoe sharingan and also added some weights which make his speed improvement. Shadow was still dwindling about his thoughts as to why he was doing all this though, there was still reason why he trained so hard. doesn't want to show his skills to anyone, his only goals had been set, but he still wanted to get his revenge. Shoving the mental note aside as Shadow then sprang into action. The fluorescent glow and sparkle of the Royal Katana was fantastic, it screamed elegance and power rolled into expert craftsmanship and proper purpose. With the Royal katana on his side, Shadow will be unstoppable. The feeling which he could say that he lived for; invincibility. His hands dropped limp at his sides, With the Royal Katana in hand with the powerful chakra which he found on the cave had made a dangling lightning chakra attached to Shadow's body. The Royal Katana now spinning furiously, the shine of the material and the sheen of powerful chakra gracing it's surface was allowing for the blades of these weapons to light the lightning chakra up to quite a powerful degree. Shadow could feel this energy, the kinetics and even the chakra which these powerful tools in his hands It rushed through his veins, just like cocaine would have surged to the brain. Shadow's right hand then came forward, and the Royal Katana which was at the will of his right hand darted out to a tree and slashed clean through the bark and the entire plant. The tree then fell down, with a loud crash. Shadow's left hand followed his right and began to conduct the Royal Katana with relative ease. Like a skilled Swordmanship, Shadow's wrists flicked inward and back out, forward and sideways, in any direction which his hands went, the Royal Katana followed. It was an amazing feel, complete control. In fact, the recently acquired Royal Katana were so incredibly powerful that Shadow could have cared less about being blind now. The chakra readings from the Royal Katana were his guide, and using the Lightning chakra it navigate was hardly necessary. The weapons were like a guide dog to him now, and as long as he had them nearby, his sense would prove to be sharper than most of the Uchiha's sight. Experimenting with various tactics, Shadow's spent a while practicing with the Royal Katana weapons. Each turn of his hands was quite erratic in motion, the arches of the Royal Katana were sharp, but accurate. Each time cutting down the targeted tree with extraordinary ease. When Shadow had finally managed to get bored in the slightest, he sliced a few of the leaves in the trees to ribbons just for kicks. No one his rank should be messing with him while he had these creations by his side, because while they were in use; a single swipe of the blade had the potential to dice Shadow's opponent to cooperate confetti. Soon enough Shadow was strolling about the area, looking for something of interest to do. Shadow grew rather bored after a while, the strolling about the forest wasn't making the cut for entertaining him. He nodded at a thought, which should prove to be quite a good idea. He sat down to the ground, hands scrunching into fists as they rested at the wrist to Shadow's laps. Entering this meditative state, Shadow fell into a thought dive coma. Completely immersing himself into his mind, and searching them deep for any kind of help to his training. it seemed a rather ridiculous method, but maybe, just maybe, it would work. it was an odd sensation, being in your own mind and exploring it like a jungle. Scanning through the memories which he didn't really know that he had, Shadow was growing irritated. This anger towards his father killer which he felt, was clouding his thoughts. What kind of ninja commits a crime after a ninja is hopeless? It didn't make sense to Shadow. The single drop of reasoning which he could have built a story on was just not there. Although he could remember so much, there were a lot of gaps. Shadow had no idea what his real father looked like, he just knew that he was born in the Akatsuki Organization and they took him in as their own. Only later to be shunned for being blind. He lost it, Shadow was literally kicked out of his own head. Letting out a frustrated sigh, Shadow then moves his hands backward to the earth and leans onto them. His head tilting up as the chirps of the birds allowed for him to see what was going on up in the trees. The scent of the cool air was damp, but fresh. Judging by this Shadow made the deduction that it was night time, a factor of the day which he would rarely bother to distinguish. Today was different, however. The mixed feeling of calmness and anger was strange, but somehow empowering. Searching his chakra pools again out of interest, Shadow decided to investigate what was open while he was feeling this way. His chakra gate for learth energy was sealed; for whatever reason. As if it had never been used. Shadow edged on, digging around and looking for an element yet to be tapped. There was one, and just one exclusive of the lightning chakra. Darkness. Shadow was feeling heavy hearted, and the darkness of his thoughts had seeped into his chakra system. Darkness was known to be an extremely risky element to harness, it would either improve the power of the user greatly, or leave them as a crippled mass on the ground to forever be viewed as a useless paraplegic. Shadow was going to give it a shot, even though he did not look forward to becoming a vegetable. Concentrating, he opened the chakra element; darkness. As soon as he hit that mental button, a creeping format of shadow crawled up his legs, to the torso and then spread to the arms. Soon the darkness enveloped his entire format, leaving Shadow in a suit of shadow. As the shadow reached his face it covered his visage altogether, and had a suffocating effect on Shadow. Remaining focused, Shadow resisted choking or panicking. A few moments later, he let out a loud yell. The darkness element was attacking him; striking at every vital point with a mounting concussive force. Shadow grit down his teeth, the pain wrecking at his body was immense. But pain was the mind killer, and Shadow's mind was meant to be the killer, not the victim. He realised that this was a fight between him and the darkness, the eerie element which eluded him. Focusing even more, he pressed down on the specific chakra opening which he had found the element, closing it slowly, but surely. The pain did not ease for the first few seconds, and Shadow swore that he felt his ribs crack under the pressure. However, the darkness soon crept back downward his format and sank into the ground, and then; forced itself into Shadow's shadow. The moon painting his face with it's pale light. Panting, he fell to his knees. Running a worried hand over his chest, to reveal that nothing had been broken. He left himself there for a while, trying to recuperate from what just happened. Shadow was soon back to his feet, moving from the forest to another area to once again try and find something interesting to do. Shadow, with his hand over his injured arm, allowed for himself to finally drop down to the ground. Sitting with an arched back, he examined his arm. It was still doused with blood, and yet to scab up. The same with the gaping hole in his shin which had been caused by the Darkness Element. Resting his head on his knees, Shadow was still unaware of the black haze which pestered his injuries. And then suddenly... A black figure appeared right beside him. This gave Shadow quite the jump, making him double over away from the figure and get into a defensive stance. The rustling of the fallen leaves from the trees above gave him a general idea of what had come out of nowhere. His guard lowered slightly, and then completely. Approaching the black figure which hadn't moved an inch. He clapped in the format's face, and reckoned it to be someone with sharp features, eyes without any real detail and a simple cloak like his. Shadow didn't know that this shadow person was actually himself in an altered state, his doppleganger. Being blind Shadow simply had no idea what he himself actually looked like, but figured that the form right infront of him which stood at exactly the same height had some kind of business to settle with him. The twisting and turning pastel black flesh of the doppleganger resonates with an aura of some kind, an aura similar to that of Shadow's. If not similar, then exactly like it. The doppleganger reaches forward to Shadow, and then thrusts what looks like a fist to the side of Shadow's head. Shadow failed to notice in time, but for whatever reason wasn't scared. Soon, he was plunged into a world or area which wasn't the forest. Something was off about this image; he could see. The colors, the detail, the whole deal. He looked left, and then right, finding the doppleganger to be right behind him. It tapped Shadow on the shoulder, as if to ask him to turn around. In doing so Shadow looks to a mirror which the doppleganger is beside, and examines his own facial features for the first time in his life. His features were just as sharp as the doppleganger's, his eyes were odd and extremely detailed. The golden pupil and the silver slit, was the most sinister part of Shadow's visage. Coupling this with his pale skin color made him look quite scary. Looking to the doppleganger, he looks back to the mirror, and then back to the doppleganger again. Realizing that they are exactly alike apart from flesh tone, thoughts begin to flood Shadow's mind. If he wasn't already in his mind, that is. "What are you?" Shadow says to the doppleganger, or himself. The shadow like creature prods at Shadow's chest, which made it clear that it understood him. "So..you're me?" The doppleganger nods to this, and then plucks at Shadow's cloak before plucking it's own. Another tap to Shadow's head from the doppleganger sent Shadow back into the real world, sitting in the forest. He was back to being blind, and the what he just met was himself. Some other worldly form of him. Shrugging it off, Shadow then heads off back to the village; ready to become a chuunin rank. Something stopped him from doing this, and his vision from the genjutsu which the doppleganger had used on him was now effective in the real world. 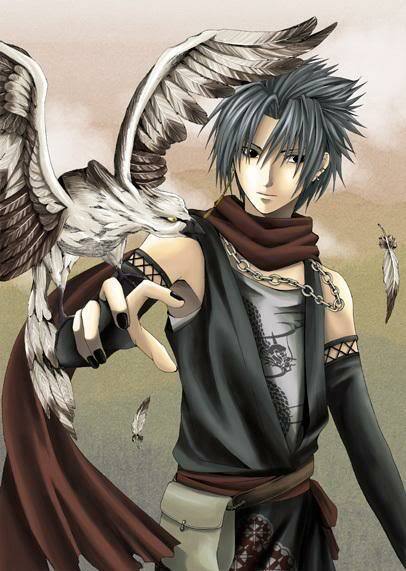 Shadow could see the chakra flow, the colors and details of his surroundings. He could probably see more than the average ninja, and more than most. Instead of heading back to the village, he decided to check back with the blacksmith. Eyes glowing a deep red from the changed red pupil and black slit.